With Aquascape’s 40” Green Slate Patio Pond, incorporating the beautiful sights and sounds of water into your balcony, deck, garden or patio has never been easier. 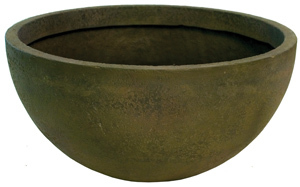 If you’ve ever tried to turn a standard ceramic or steel bowl into a container water garden, you know how difficult and costly it can be to try to add plants to a regular bowl without shelves. With Aquascape’s 40” Green Slate Patio Pond, those struggles will become a thing of the past because each patio pond comes complete with integrated plant shelves allowing you to easily create a beautifully elegant water bowl or container water garden. Aquascape’s 40” Green Slate Patio Ponds give you the best of both worlds, not only do they have the natural beauty of real rock, but they’re light weight with the durability of fiberglass. These stylish and versatile patio ponds can be used either indoors or outdoors and they age like real stone. They will never fade or chip. With 3 convenient sizes, 24”, 32” and 40” and 3 tastefully beautiful finishes, European Terra Cotta, Green Slate and Desert Granite, you’ll be sure to find the right Aquascape Patio Pond to create your very own outdoor garden oasis.